What a fabulous turnout! This year's Academy Awards did not disappoint, fashion-wise! We saw lots of glamour and some great new trends. While the scene was dominated by darker metallic ensembles (and I'll get to those stunners! ), let's take a look at the lighter side with the spring tones that brought levity to the red carpet. Kerry Washington stayed true to MiuMiu in her fresh coral column gown. The jeweled embellishments at the top added the perfect amount of sparkle. Jessica Chastain looked every bit the bombshell in an impeccably tailored Armani dress. Her choice of red lipstick was key to pulling together the rose gold hue with her skin tone. Charlize Theron made a dramatic entrance in winter-white Dior. The peplum waist and her new pixie cut enhanced the modern silhouette. 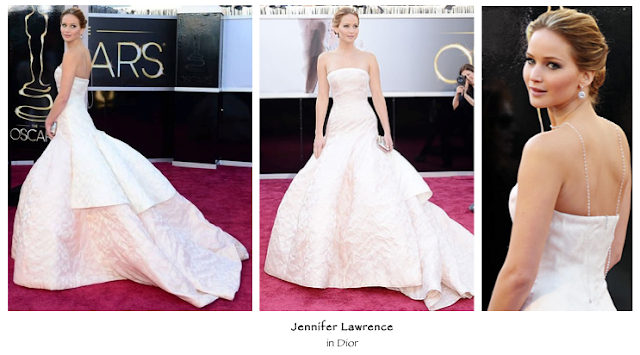 Finally, Jennifer Lawrence, arguably the woman of the night, commanded the red carpet expertly in a Dior gown from the Spring/Summer collection. It was the perfect choice for a once-in-a-lifetime moment (and who else could make falling up stairs look so glam?). When it comes to the Oscars, it's go big or go home, and Jennifer Lawrence's risk paid off with the simple texture of the dress and exaggerated full drop-waist skirt. Her backwards Chopard necklace highlighted the dramatic train and is a trend worth trying if you have a special occasion coming up! The competition was fierce, but I chose Jennifer as my best-dressed Oscar nominee. Stay tuned to see who I chose for my best-dressed Oscar guest. 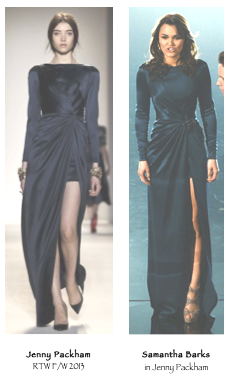 Speaking of Oscar guests, I was pleased to see that one of my Oscar gown predictions showed up at the awards! Samantha Barks, a gorgeous and talented actress who I fell in love with when I saw the film Les Miserables, wore the teal Jenny Packham during one of the most highly-anticipated performances of the night: the Les Miserables musical medley. She added a sparkling brooch to the high slit and she looked simply stunning! What were your favorite looks from Oscars night? NYFW Trend Report: Part One, Thanks for Mutton!